To realize the vision of the Northside Neighborhood Plan and the City’s Master Plan, several zoning changes are proposed including areas along Westnedge Avenue, Ransom Street, North Street, Burdick Street, and Paterson Street. For exact locations, refer to the proposed zoning changes map and table organized by property address. Residential Zoning Repair. To preserve the core residential character of the Northside, lots that currently have residential uses, and are zoned commercial (Community Commercial – CC and Commercial Neighborhood – CN1); or manufacturing (Manufacturing – M1) will be returned to existing residential zoning districts - Residential Multi-Family RM 15 and RM 36. The Commercial and Manufacturing districts currently limit or prohibit residential development and rehabilitation of existing homes; the proposed changes will remove these restrictions. New Mixed Use Districts. Three new zoning districts are proposed to encourage a flexible mix of uses (Nodes, Live-Work 1, and Live-Work 2). They each support goals in the Northside Neighborhood Plan to increase access to resident owned businesses and jobs, expand residential options, and provide for flexible production uses like maker spaces. New lot types are introduced to allow outdoor markets, outdoor cafes, limited commercial agriculture, and pop-up shops are also included. Node Districts. These areas are intended to create walkable, mixed-use commercial corners in neighborhoods. Nodes allow a wide range of commercial uses on the ground floor with commercial and residential uses allowed on upper floors. Live-Work 1 District. Live-Work 1 allows for residential and businesses together and near each other. A wide mix of commercial and residential uses - including single family homes and duplexes are allowed that match what already exists in the neighborhood. Live-Work 1 has a focus on building form as it faces the street, while allowing a flexible uses within the building. Along many streets such as Westnedge and North Streets, the use of this district also serves to remove the barriers to the building of and rehabilitation of existing single family homes. Live-Work 2 District. Live-Work 2 also allows for residential and businesses together. The district allows a wide mix of uses, including residential, commercial, limited industrial, and maker spaces. The district serves as a transition from the higher density of Downtown and nearby Industrial. Live-Work 2 has similar requirements to Live-Work 1. Ensure zoning preserves existing and allows new residential uses. Create zoning that is flexible and allows a mix of residential, commercial, and maker spaces. Informal open house where residents can stop in, learn more, review the proposed changes in greater detail, and ask questions of City staff about how the changes may impact your property. 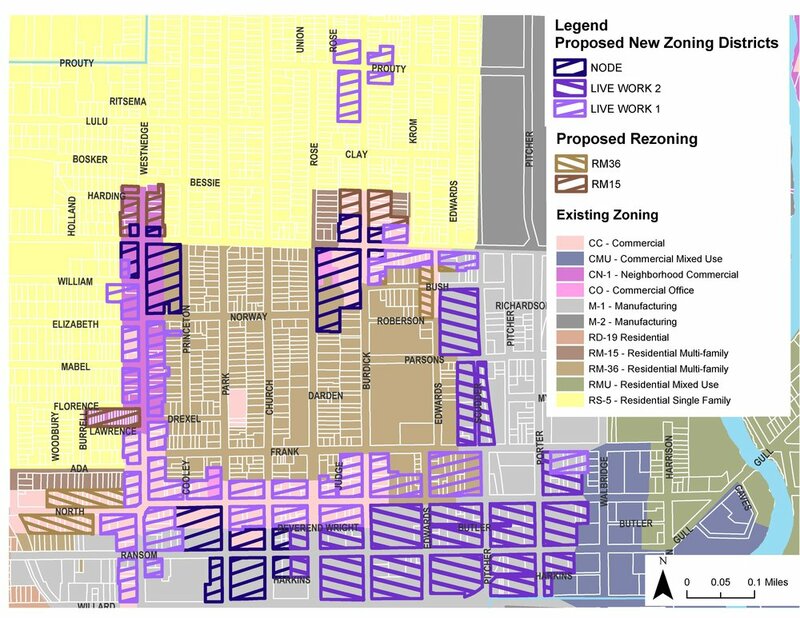 Zoning adjustments in and adjacent to the Northside Cultural Business District (NCBD) will remove barriers to economic development and help the Northside meet its vision for walkable streets providing for a mix of uses and housing that meets the needs of all its residents.